Living the Lifesubmitted by Michalis B. - Apr 14, 2019 |Recommended: YesBuckhead 960 is located in one of the best locations of Atlanta. The apartments don't only look good, but they bring people a smile. Everyday when I come home from work, I'm excited to pop my feet on the couch and open the blinds to look at my amazing view. You Can't live better than that. I absolutely love these apartments. If I could literally take this apartment back to Chicago with me, I’d be living there.submitted by Lashawn P. - Mar 31, 2019 |Recommended: YesPeaceful and overly satisfying. 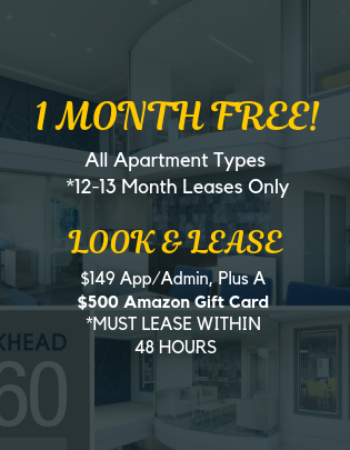 A great place to live for Buckhead professionalssubmitted by Martin N. - Feb 01, 2019 |Recommended: YesFirst off all of the staff leasing, property manager, and maintenance included are so helpful and nice. Our neighbors had some sort of maintenance issue and Tina personally showed up to our apartment on New Year's eve to make sure that no one else had issues. Jared, and the girls in the office are always so helpful and nice. The pool and the grill are super popular in the summer, and being walking distance from the Marta and the malls is so nice. I've lived here for two years and could not be happier. Anyone looking for an affordable place to live that's near their office should look into living here before anywhere else. response from property - Feb 04, 2019 Thank you so much for your 5-Star review! We appreciate your feedback and compliments. We love our team and the conveniences to MARTA and the malls also. Thank you for choosing Buckhead 960 as your home! response from property - Mar 12, 2019 Thank you so much for your 4-Star review. We appreciate your feedback and so glad you chose Buckhead 960 as your home! Great Propertysubmitted by Maurice N. - Nov 16, 2018 |Recommended: YesGreat Location, Helpful Staff, Quiet and Peaceful at night. It's been a nice experiencesubmitted by Terri A. - Sep 25, 2018 |Recommended: YesEveryone in management office has been so nice and kind to me since I moved in. Since I work next door the location has been perfect for me. Being disabled and having to uproot my life after losing my spouse was very traumatic, but everyone here has been so helpful kind. It's a very nice place to live. Great location and the 1 bed apartments are large.submitted by Alison G. - Jun 29, 2018 |Recommended: YesThis is a very good property and conveniently located to Marta. There are very good amenities. I have a one bedroom apartment and it is very large. with a nice big bathroom also. When you are thinking about moving in, be sure to ask about all of the related add-on fees Pet rent, trash, utility convenience fee, pet control, parking, admin, credit checks, fees for a key fob because they really add up. The office staff and maintenance staff are very responsive and fix things in a timely manner. The complex definitely needs more security, however. Waiting for upgrades. submitted by Robert K. - May 07, 2018 |Recommended: YesGreat location, staff, but desperately needs updating. response from property - May 08, 2018 Thank you for your review. We appreciate your feedback. We are in the process of updating everything on the property. Please patient with us. You will see changes this year. Management submitted by Michael D. - May 03, 2018 |Recommended: YesThe best management awesome maintenance. One of the best places I've ever lived at. My apartment and the complex is beautiful, clean and well maintained. response from property - May 08, 2018 Thank you so much for your 5-Star review! We appreciate your feedback and are so happy you call Buckhead 960 home! Highly recommend Buckhead 960submitted by Morgan S. - May 03, 2018 |Recommended: YesI have enjoyed my experience living here. The price is reasonable and everyone is so nice. They are always doing updates and keeping everything clean which is excellent. Buckhead 960 really cares about the community and the residents. response from property - May 08, 2018 Thank you for your feedback and 5-Star Review! We are so glad you call Buckhead 960 home! Stay tuned for more amazing updates later this summer! Great area, size, apartment look but hallways can be updated.submitted by Craig G. - Apr 27, 2018 |Recommended: YesI love the location and the size of the apartment for the price being asked. It is an older built complex but they've renovated the units well. I'd like better bathtubs, but overall great. Parking is great, and at least from what I've seen, there are professional tenants, so no rowdiness or loud noise. The staff is friendly and helpful. response from property - Apr 30, 2018 Thank you for your 4-Star review! We appreciate your feedback and are so glad you call Buckhead 960 home. We have a great resident referral program, so refer your friends and co-workers. When they move in, you'll receive a $500 referral bonus! Hidden Gemsubmitted by S. J. - Apr 23, 2018 |Recommended: YesLove the location, updates and friendly, responsive staff. response from property - Apr 24, 2018 Thank you for your 5-Star review. We agree with you and love that you chose Buckhead 960 as your home! Our residents are our top priority! response from property - Apr 18, 2018 Thank you for your 4-Star review! We appreciate your residency Buckhead 960. We are excited as much as you are about the improvements on the property. We can't wait to announce the next upgrade!